Independent Vocational Services Inc. (IVS) was established in 2002 to provide an unbiased alternative to vocational services of the highest quality throughout Ohio. IVS operates within the BWC system, but is not affiliated with any managed care organization (MCO), third-party administrator (TPA) or employer. We work for workers, who are most often referred to us by their physicians or attorneys. We understand that an injured worker can feel lost in the complicated system of state agencies and case management options. 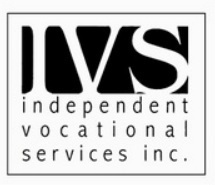 IVS Inc.'s vocational rehabilitation is founded upon the principal of advocating for the injured worker in order to secure the full benefits he or she deserves. Our goal is to give the worker an edge when facing this complex and ever-changing bureaucracy. And our pledge is to work tirelessly until the goal is reached. We know that our reputation--with employees, legal providers and medical practitioners--rests upon this pledge. If you are an attorney, physician, pshycologist or injured worker interested in making a referral, complete the IVS Referral Form and fax to IVS at 1.866.337.0003.